I was six feet away from an 800 lb. giant in brown fur with huge paws and I didn’t get eaten. 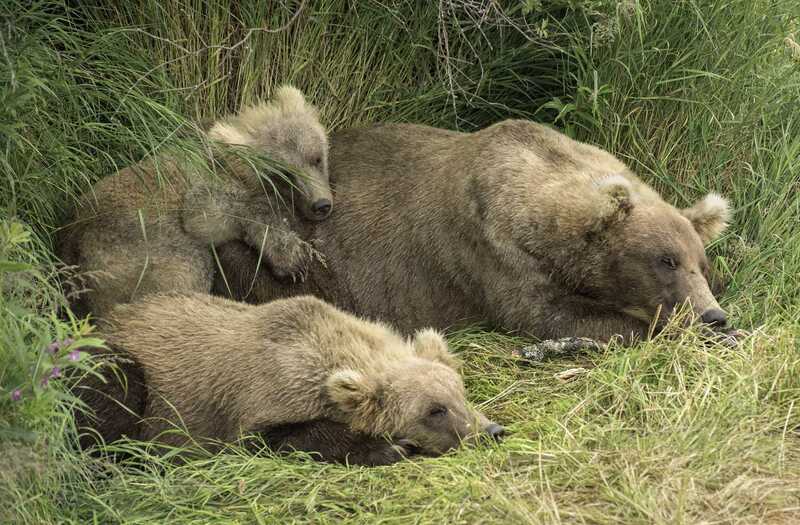 If you want one of the greatest wildlife experiences in your life, put Katmai National Park in Southeast Alaska on your list of future destinations. 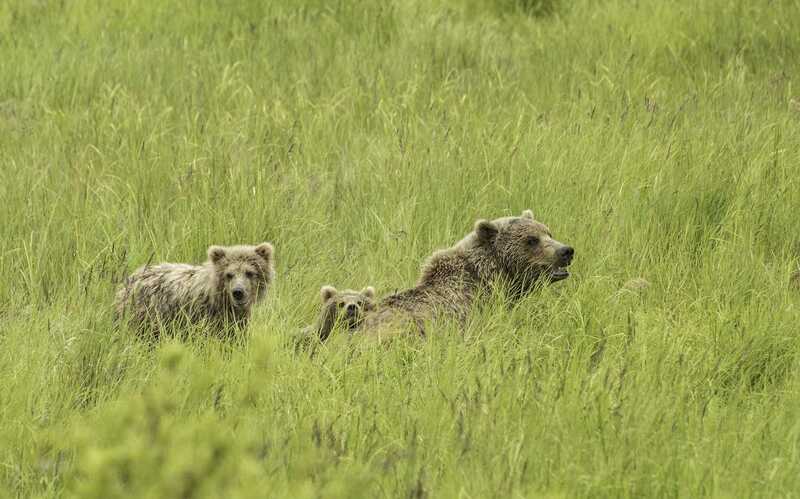 There are 2,200 Alaskan brown bears inhabiting Katmai National Park. They are called Grizzly Bears in the lower 48 states of the U.S. During the summer the salmon return to the rivers of Alaska by the millions. The bears of Katmai have lost a lot of their body weight while hibernating are looking for food and a lot of it. Sow bears may have cubs to feed and to teach how to fish. 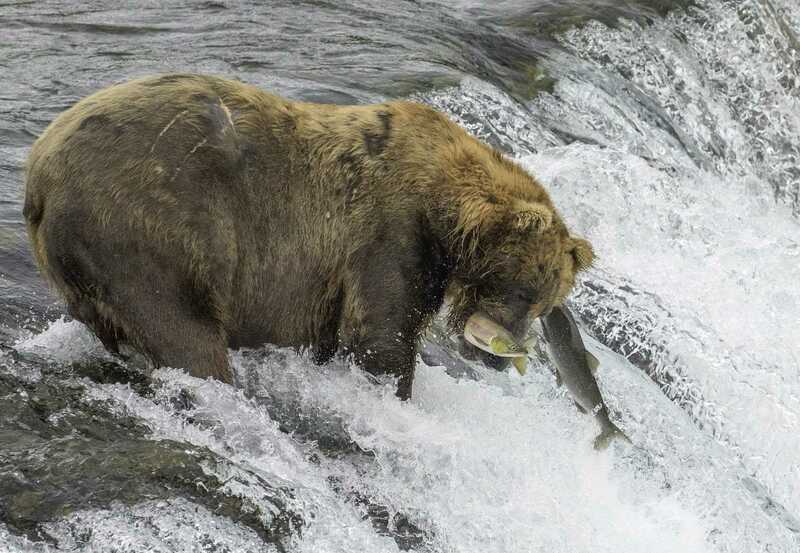 This brings them to the Brooks River and especially Brooks Falls in Katmai National Park to find their salmon feast of Sockeye in June and July and Silver salmon in late August and September. Flying in a small plane is mandatory if you want to get there. The four seat Beaver float plane I was in, skimmed over the emerald green expanse of Southeast Alaska. I was nervous in anticipation of arriving at Katmai National Park or maybe from being in a small plane with only one engine. I wanted to see the giant brown bears fishing, playing, fighting, and to watch mothers with their cubs. I knew any adventure to Alaska even in summer is weather dependent. The weather in late July was warm and partly cloudy with patches of blue sky peeking through the cloud cover. I couldn’t wait to get my camera out of my backpack and get going. 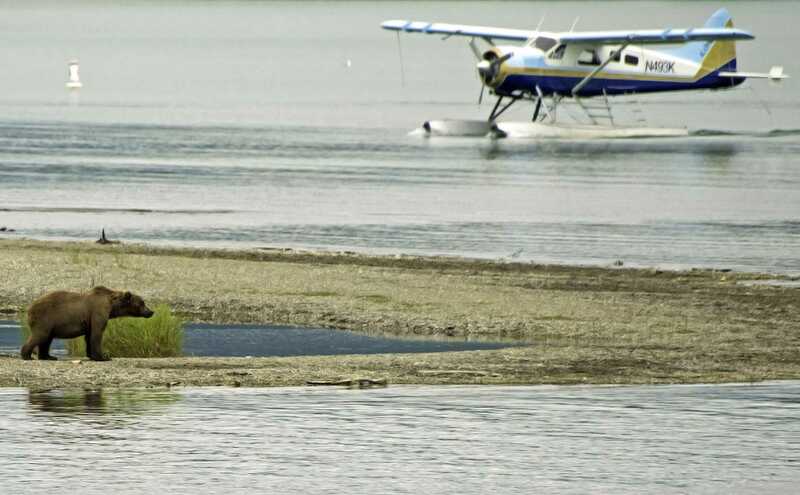 The floatplane skimmed to a smooth landing on a calm and glassy Lake Naknek and coasted up to a sandy beach at Brooks Cam p. I had to attend “Bear School” by a Park Ranger before continuing my trek to the bears. This is a 20 to 30 minutes orientation to the bears and their habits and especially how to keep all of you parts intact. The rules are simple but they work, I know. I still have all my parts even after a close encounter on the trail. Luckily, the bears are used to humans and have so much to eat at this park you can get closer than any place else to these large carnivores. If you got as close say in Denali National Park you would probably be missing some pieces. Once you receive your “bear” pin you are allowed to take the well worn trails to the three viewing platforms to catch your first views of the magnificent animals with golden to dark brown fur. I got maybe 50 yards down the forested trail when I and other new arrivals were stopped by a Park Ranger and told we would have to wait on a bear that was passing by. This common occurrence can result in a “Bear Jam” of several tourists waiting to continue their hike to the best viewing platform at Brooks Falls about 1.2 miles from Brooks Camp. I saw Rangers constantly patrolling the main trails to keep everyone safe. The wooden bridge, over the gently flowing waters of the lower river, swayed as I and others walked across it to the Lower River platform. This area is quiet and peaceful with gently flowing waters where if you look you can see the bright red Sockeye resting in the clear water before their journey upstream to the falls to past the gauntlet of hungry predators to spawn. Once you pass off the main road onto the narrow but well travelled trail to the falls, start singing or chanting to let any nearby furry friends know you are there, as bears frequent the same trails and roads as people in Katmai and they have the right of way. I could hear the roar of rushing water and of bears growling before I saw the Falls. Your first view puts a huge grin on your face as you see the bears fishing for the first time. 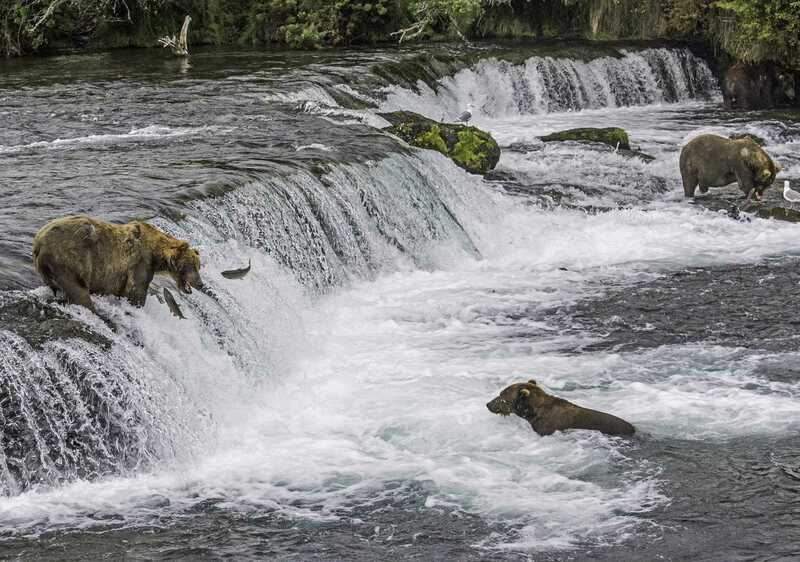 The viewing platform at Brooks Falls is well worth the hike for you get a wonderful view of Alaskan Brown Bears fishing for Salmon just 25 to 50 yards away. Most of the pictures you have seen of bears catching Salmon in their mouths were probably shot here. During my two evening visits to the Falls I saw 18 and 21 different bears visit this area on respective evenings. What a sight! Several family groups of a sow and her cubs stopped by to fish too. This place is nothing short of amazing. I had bears pass by the viewing platform at distance s of 6 feet. A mother and her three cubs even decided to take a nap right below the platform. A large adult male who had the best fishing spot was named Lefty. He was good too. I watched him catching salmon every few minutes. He would rapidly eat the bright red fish and go back for more. He had to earn the best spot to fish and has the scars to prove it including only half a left ear and scars from claw marks on his hip and chest. He caught so many fish he had to take a break and just sit down in water to rest. Another bear seemed to just enjoyed the Jacuzzi like waters at the bottom of the falls. I sometimes get so busy shootings images I forget to stop and just watch this amazing ritual of nature. The Falls viewing platform can get crowded during the peak visitor times from late morning to mid afternoon when most of the tourists fly in on day trips from Anchorage, King Salmon, or Homer. The best opportunities to see a lot of bears is to stay at Brooks Camp either in the lodge or campground. I spent two nights here and it was worth it as my best experiences were early in the morning or late in the afternoon when there were less people around. One morning, I had the Falls platform to myself. That was when I saw my first bear fight. A mother with three cubs challenged a young male adult for his spot at the falls. She and her opponent got up on their hind legs and with huge claws out, roared at the each other and bared their large teeth. Three cute little cubs watched from nearby. The female prevailed and the young male moved off. I almost missed the sign for the Mid-river platform as it is accessed off the same board walk as the Falls. I was thrilled to see another Sow with dark brown yearling cubs working the riffles for bright red salmon as the morning sun broke thru the clouds to light up the river. Getting to Katmai National Park is not difficult but it is a remote locations that can only be accessed by plane or boat. Most people fly commercially into King Salmon and then take a 30 minute float plane trip to the park. There are several day trips you can take as mentioned earlier from other cities. Be prepared though nothing in Alaska is cheap during the summer but this experience is well worth the bucks. You should also make your reservation several months to a year in advance as they fill up fast. I cannot tell you to go here enough. Go to Katmai, Go to Katmai, Go to Katmai. If you can’t go but want to share the experience virtually go to Exlpore.org in early July thru September and watch their live ‘Bear Cam” of Brooks Falls. You will see many of the same things I did but it is not the same. Katmai is a place you must experience in person.